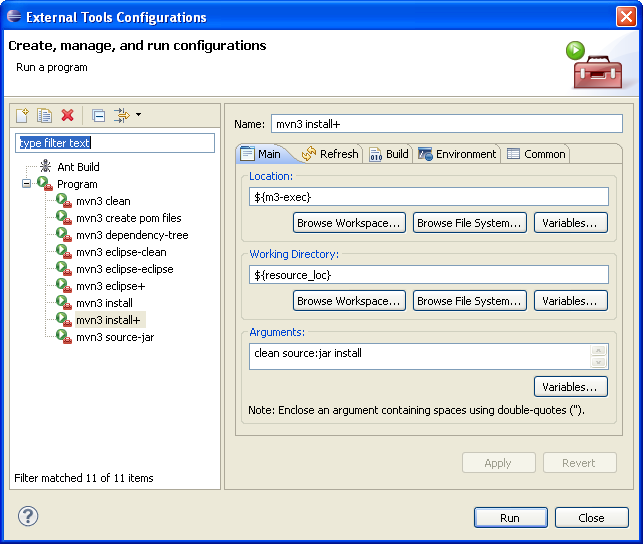 The tutorial describes how to set up Eclipse better before you start to develop an application. In Eclipse Window->Preferences->Java->Installed JREs. The location of the JRE definition should be the path to the Java JDK SE. In my case "C:\Programme\Java\jdk1.6.0_22". This point is optional. Only if you have installed Maven 3 and if you wish to use it verify the following setting. Descrtiption: Path to maven executable in the local file system. Download the metadata.7z and unpack it in your workspace ( e.g. C:\Portable\eclipse-rcp-galileo-sr2-win32-riena\workspace\). The folder ".metadata" contains predefined launches for Maven, that can be accessed in Eclipse using Run->External Tools->External Tools Configurations. Make sure that you unpack the 7z file correctly. The launches should be in: .metadata\.plugins\org.eclipse.debug.core\.launches\.